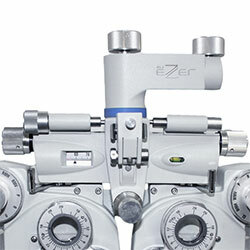 The ERF-3600 offers precision excellence in any refractive setting. 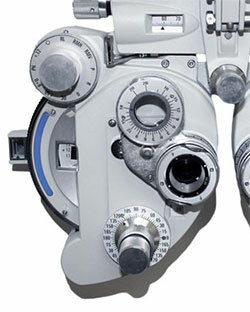 Its spherical power ranges from -19.00D to +16.75 in 0.25D steps (-29.00D to +26.75DS and ± 0.12D steps with auxiliary lens). Cylindrical power ranges from 0 to -6.00D in 0.25 steps ( 0 to -8.00D with auxiliary lens). Spherical power ranges from -19.00D to +16.75D in 0.25D steps. 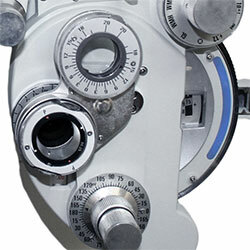 By using the unit’s auxiliary lens, you can measure -29.00D to +26.75D in 0.12D steps. In addition, both sphere power knobs can be quickly changed in 3.00D steps for added convenience. 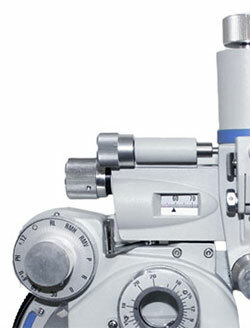 Quickly and conveniently perform astigmatic testing. The cross cylinder loupe on the ERF-3600 is conveniently synchronized with the control knob to easily change the cylinder lens axis. Measuring rotary prism couldn’t be easier. The ERF-3600 allows for vertical and horizontal measurements of 0 to 20∆ in 1∆ steps. Located on both sides, the PD knobs enable smooth and quick adjustment. 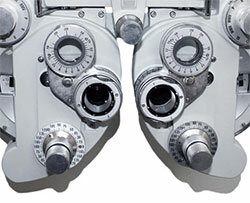 The pupillary distance adjustment ranges from 48mm-80mm in 1mm steps. For enhanced flexibility, the ERF-3600 is provided standard with 0.00D, -2.00D, and -0.12D cylinder auxiliary lenses.